If you’ve visited or driven by the Association recently, you’ve probably seen our new headquarters taking shape. Construction is occurring just beyond our current building on the side away from Kenilworth Avenue. The large steel posts and beams rising from the red clay provide the first above-ground glimpse of our future on Greenwood Cliff. Our new building has been a long time coming; we’re in great need of an updated space — a building not structurally and mechanically challenged as our current one is. It was built in the 1960s and has served us since 1993, but it’s time to have reliable HVAC and plumbing, better classrooms for Mingle School of Real Estate and much more. “Much more” means better facilities to serve our members overall and a heightened presence in Charlotte’s Midtown area. Classrooms used by Mingle School and our technology staff will now have AV systems with big screens, updated audio and interactive white boards. We’ll also have an area similar to the Genius Bar in Apple Stores where CarolinaMLS members can bring their devices and talk to our tech staff about MLS-related concerns. 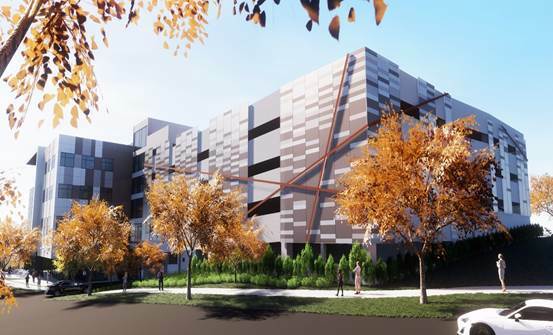 Projected to be completed in spring 2019, our building also will have a comprehensive security system, real-time information boards, coffee and refreshment bars, large windows and seamless connectivity to our parking deck (214+ vehicles). The building’s moveable walls will allow us to “right-size” meeting spaces, allowing large committees and groups to meet there instead of going offsite as they do now. Having our headquarters in Midtown also will help us continue to promote the Realtor® brand. Midtown is a high-profile part of Charlotte that’s been redeveloping over the last 10 years or so. Our leadership was wise to invest in land near our current building starting in the early 2000s. They knew the Association would benefit as the land appreciated. As a result, the vast majority of our new building and parking deck are paid for with proceeds from the sale of land we owned around our new headquarters site. The recent national dues increase, by the way, is NAR-specific and unrelated to our local association. Also, none of your local dues or CarolinaMLS fees are being used to defray construction costs. As we bought Midtown parcels over the years, it was not a given that our new headquarters would be in that location. Our board of directors decided that in 2014 after careful contemplation. Midtown’s central location to our membership, good road network and growth were key factors. Prior to the decision, the Association’s Greenwood Cliff Task Force, appointed by the board, advocated staying in Midtown. It did so after looking at the current facilities, studying the best path forward and presenting a feasibility study to the board of directors. Serving on the task force was one of my first involvements at the Association. As a former full-time architect, and as a Realtor® of only a few years at the time, I was honored to be asked to serve in this capacity. The professional growth I’d sought by volunteering at the Association had already been terrific, and I appreciated the opportunity to share my ideas as someone trained in building design. I’m proud that our headquarters will contribute to the vibrancy of the Midtown area. It will face Pearl Street Park and offer a contemporary, inviting design. Mecklenburg County Park and Recreation is overhauling Pearl Street Park, where it will be cool for us to have a public-facing presence and hold events in the park if possible. Also, our covered rooftop patio will provide a view of the city skyline and serve as an event space for us and be rentable by others. I’m also excited that our headquarters will be environmentally conscious. Committed to attaining LEED certification, we’ll have many green building features: energy-efficient mechanical and lighting systems, low-emitting materials, advanced energy metering, reduced water use both indoor and out, lower heat production via a “cool roof,” bicycle and green vehicle parking and electric-charging stations. I believe sensitive, thoughtful construction in one of Charlotte’s most desirable areas shows we are good stewards of resources. It also helps tell our story to the community of who we are as Realtors®.